An American Missionary, this Norman Rockwell painting, appeared on the cover of Life Magazine published April 18, 1918. An alternate title for this picture is Soldier Playing Baseball. This was the sixth cover by Rockwell to appear on Life Magazine. A Rockwell illustration appeared on the Life magazine cover a total of ten times in 1918 and twenty-eight times in all. Norman Rockwell didn't paint the gritty, dirty or horrid pictures of World War One. His paintings from this period usually were meant to show a bright side, even during a time of upheaval like the war. Here Rockwell shows one of the American ambassadors of goodwill. This American soldier is teaching a child how to play America's favorite pastime, baseball. I am unsure whether the child is a boy or girl. The hairstyle and facial features suggest a boy. However, the clothing on the child looks feminine. Still, I am certainly no expert on children's clothing in World War One France or Belgium. 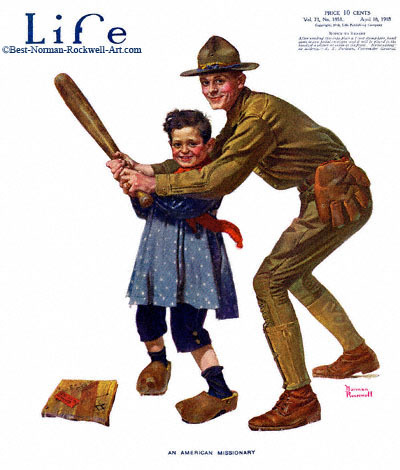 The soldier is teaching the child the proper batting stance. Will he/she hit a home run? Possibly he/she will be afforded the opportunity to use this newfound skill to defend against enemy soldiers. That would indeed be a home run. And a good use of the bat.